I actually paid attention to my alarm clock and got up at 3:30 am on Saturday morning. It was a cloudless night, and perfect conditions for NASA to launch a resupply mission to the ISS. I posted an update to my original Friday night post on the pending launch – but for those normal people who don’t re-read posts, here’s a quick recap of that, and a couple shots of the launch from my vantage point. Update — I did manage to get up in time for a 4 am launch under cloudless skies. Below you can see the initial appearance of the first stage emerging from behind the trees and the neighbor’s house, and a (very poorly) cropped-together series capturing the entire visibile trajectory. The gap in the visible line represents coasting of the Antares between main engine cutoff and ignition of the second stage, where from my perspective, it just went dark! 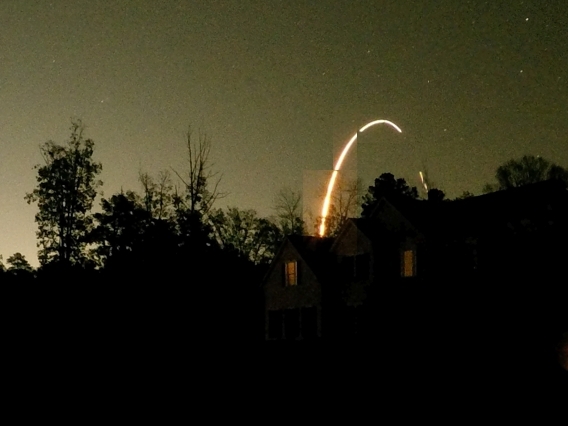 Rough overlay of several 30-second exposures, showing the entire visible trajectory of the launch from ~70 miles away. The rocket rolls off to the east rather quickly, headed for Low-Earth Orbit. The gap is the period where the rocket coasted, between main engine cutoff and second-stage ignition. This track represents a little more than 3 minutes of flight time. Yes, I am one who does not see these thins coming in time to set the alarm. I have see a launch from way out here in Central Virginia. This one would have been great as t he air was cold and dry. Sorry I missed it. Thanks for the nice pictures. I was thinking about you on this one – one of my Instagram followers posted that he had seen it (though low) from a east-facing mountainside 200 miles away in Pennsylvania!